A company based in Dubai on Tuesday announced it had terminated an employee who made inflammatory comments on Facebook about the March 15 terrorist attacks on two mosques in New Zealand. The comments apparently linked the New Zealand attacks, which left 50 people dead, to the suicide bomb attack on a CRPF bus in Pulwama, which killed over 40 jawans, in February. Transguard Group, a security and manpower services company with over 65,000 employees, conducted an internal investigation into the matter over the weekend after several people shared screenshots of the comments and complained to the police. In a statement, Transguard said the man had used an “assumed name”. Transguard said he “was terminated from our employment and handed over to the relevant authorities as per company policy and UAE Cybercrime Law”. Transguard added he had been deported by UAE authorities. While Transguard and the UAE government have not revealed the identity or nationality of the man, several Facebook users shared screenshots of a user by the name of Rony Singh, whose description stated he started a job with Transguard in August 2017. 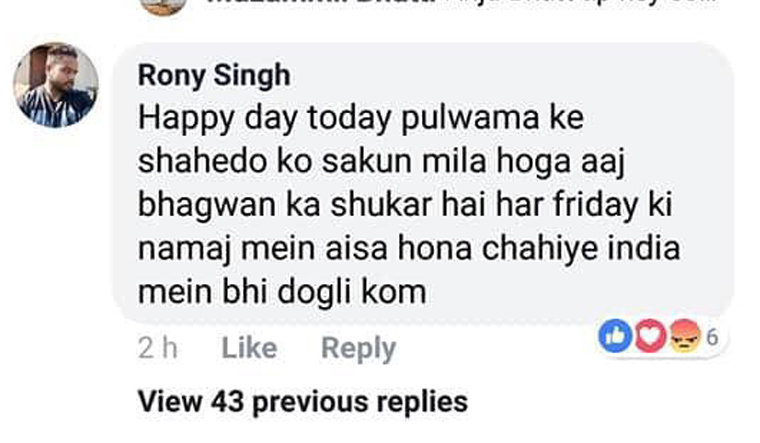 In the post, the man claimed the Christchurch attacks were a “happy day”, which would “bring peace” to the “martyrs of Pulwama”. The man added “this (such attacks) should happen on every Friday during namaz in India also”. This is not the first time the UAE has cracked down on people who have made offensive social media posts on issues related to India. In June last year, an oil company in Abu Dhabi terminated the employment of a Keralite man who had uploaded a video on Facebook in which he threatened to kill Kerala Chief Minister Pinarayi Vijayan. The man, who claimed to be an RSS activist, was arrested on arrival at New Delhi Airport the same month. In 2017, a paint company in Sharjah terminated a Keralite man who sent lewd messages to noted journalist Rana Ayyub, who has been a strident critic of Prime Minister Narendra Modi. Ayyub had shared screenshots of the individual's Facebook account and messages, following which social media users complained to the company.